The original alphabet can be traced back to the Phoenicians, who developed a set of symbols to represent spoken sounds. The Greeks adapted this alphabet and then developed the fine art of handwriting. Many years later, the Romans used the Greek alphabet as the basis for the uppercase alphabet that we use today. Several styles of handwriting came about, and they were used for different purposes. Some styles were more refined than others, and these were used for important works, while the more informal styles were used for more mundane purposes. Books were born at this time, and they were only available to the wealthy. I am so glad that history has changed that fact! The world of typeface changed in 1445, when Johann Gutenberg perfected a practical way to utilize movable type. Moveable type is a process of printing that uses individual letters that must be set in order, usually a page at a time, before printing. This allowed for mass printing of materials. 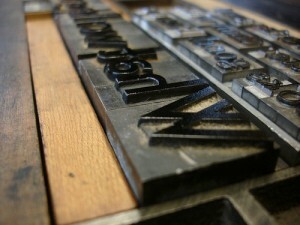 While Gutenberg did not invent the printing press, he did design a more usable version. Over the next 50 years, approximately 10 million copies of 3,500 works were printed. Education as we know it had begun. The early type design style, called blackletter, was hard to read. There was not much variation in thickness on up or down strokes, and this sometimes, left print that was almost illegible. Typeface styles changed, much like clothing styles, based on what was considered popular at the time. Different printers had their own ideas regarding the best type design to use. Some of the Roman styles used in the 1800s were reminiscent of writing with a flexible steel pen or a quill. They were crisp, clear, and easy to read. Other type design was more elaborate and, in some cases, harder to read. We have so many styles and designs to choose from now that we can get overwhelmed. I find myself going back to my old and comfortable standby typeface when I am having a hard time deciding. I think that all of us have a favorite typeface that seems to work for us, then a couple of backups for when we want to change it up a bit. History shows us how many amazing choices there are and where they came from. Let this information guide you every once in a while. Depending on the project you are creating, maybe a little history lesson will influence you as you choose the print style that will make your work amazing. Too much history can be overwhelming to me, but a little bit can be a lot of fun. Now go create, be historic, and have some fun!